Spontaneous combustion of Li-ion batteries has been a problem before. Tesla Motors has to use dedicated cooling for its electric car battery system that consists of thousands of such battery cells in fact. 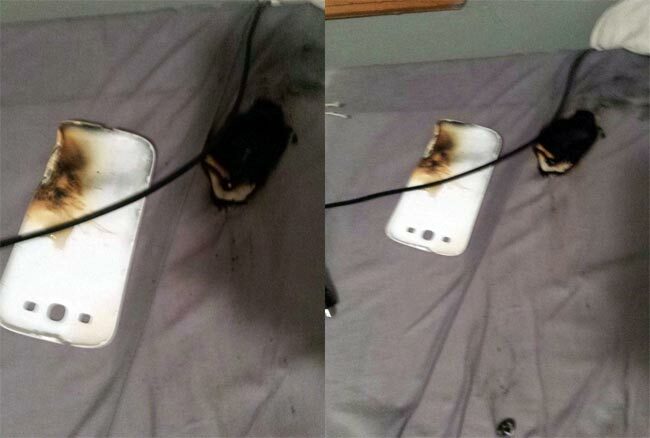 Sometimes it seems a cell phone battery just catches on fire, and now we have another example. So, I woke up, and saw a ton of smoke coming out of my phone — it also smelled REALLY bad. Half asleep, I jumped out of bed and turned the light on, only to see that my phone was just beginning to go on fire. I dumped a glass of water I had in the room on it to stop it from burning…then woke up my brother to come help. The smoke smelled so bad and wafted through the entire second floor of my house. I had a foam mattress pillow top that had a hole burned through it too–which we later threw out because it was still burning throughout. Also, some of the plastic on my phone was melting and kind of shooting out of it, and some landed on my pinky finger and burned some skin off (very small burn though). ALSO: To answer many questions: EVERYTHING was stock/Samsung that I had received when I purchased my phone. Stock battery, charger, etc. Additionally, my phone was NOT rooted. He won’t be sleeping with his phone anymore. That’s for sure.